1 in 5 Peruvians live in a situation of poverty (INEI 2017). The housing deficit in Lima is 41%, which means that more than 4 out of 10 of its inhabitants do not have a decent home, either because the material or spatial structure is not adequate or because the home does not have access to basic services. Peru is the third country in Latin America with the largest housing deficit. According to the Ministry of Housing, Construction and Sanitation, housing is not affordable for low-income families, and public policies fail to close the housing deficit gap. 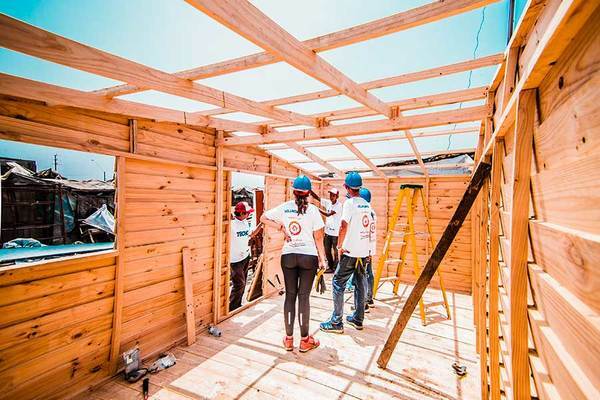 TECHO is a social organization that works for the community development of the human settlements of Lima, Callao and Piura. They opt for the sustained work hand in hand with the communities, to give an effective and immediate response to the needs previously identified, and thus transform the lives of Peruvians in poverty. From TECHO, they manage the construction of emergency housing, which is a space that meets the conditions to improve the quality of life of its inhabitants, as well as a rapid response to natural phenomena. Construction of an emergency shelter with pre-fabricated material for families living in human settlements with housing needs. Detection of the community in need and allocation of the beneficiary family. Four families with housing needs will have a home. Reduce the housing deficit in Peru, guaranteeing access to decent housing for all families.